Kinesiology is a therapy. It developed out of Advanced Chiropractic studies in the USA in the 1960s and 1970s. Dr. George Goodheart is considered it’s founding father. He discovered that muscle testing could be used to evalute a person’s overall health. Following this discovery, kinesiology developed several new techniques. These allow the practicioner to evaluate the nervous, lymphatic and vascular systems of a client. As more research was conducted, huge advances took place. Kinesiology became a broad and diverse discipline. There are many different types of kinesiology. At Cork Kinesiology, ‘Specialised’ or ‘Energetic’ Kinesiology is practiced. This system uses the original kineisology techniques, described above, but also incorporates principles from traditional chinese medicine, as well as Indian Aruvedic medicine. The most fascinating element of Energetic kinesiology is the way in which elements of the Chinese and Indian systems are used to locate stress at very deep levels in the body. This, in my opinion is the greatest contribution that has been made to the discipline of kinesiology. 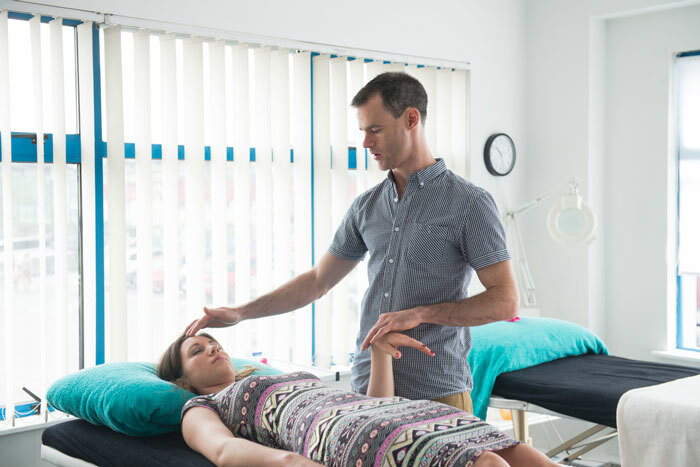 What happens in the course of a kinesiology treatment? Kinesiology is a very gentle therapy. The kinesiologist uses ‘muscle-feedback’ from the client to evaluate stress levels in a variety of areas. The picture above shows the standard ‘muscle test’ used by the kinesiologist on a client. The client usually remains lying down for the duration of the kinesiology treatment. The muscle being tested acts like an indicator switch to show the kinesiologist when there is a change in the clients body state. A typical treatment takes about an hour.